In order to describe and understand possible problems associated with deafblindness we applied a functional analysis case formulation strategy and Functional Analytic Clinical Case Diagrams (FACCD). We collected clinical assessment data from deafblind persons who were experiencing multiple psychological problems as reported by their healthcare professionals. The data were collected after the healthcare professionals were trained in functional analyses and in applying FACCD. The 21 deafblind persons assessed by healthcare professionals were reported to have 3–11 psychological problems. Two case examples are given to illustrate the complexity of a deafblind person's life situation and the functional relations among problems and possible causal variables. Thus, in addition to vision, hearing and communication problems, deafblindness can be associated with other psychological problems that may benefit from more precise psychological assessment and treatment. We found that the functional analysis and FACCD were useful in helping assess and understand persons with visual and hearing difficulties, especially when there are indications of concomitant psychological problems. In Finland there are approximately 800 individuals, who have dual sensory disability–deafblindness.1 Although the term “deafblindness” refers to total deafness and blindness most of the individuals having these impairments still have residual hearing and/or vision (The Finnish Association of the Deafblind 1996; Kaitalo 1990). Within the group of the deafblind there are individuals with acquired deafblindness, in which hearing and/or vision problems initially occurred later in life (around 80% of the deafblind population, NUD 1986; 88%, Olesen and Jansbøl 2005) and congenital deafblindness, in which the sensory impairments initially occurred in early childhood (about 20%, NUD 1986). The percentages of each group among the deafblind population are fairly similar in all the Nordic countries. Due to varying degrees of hearing impairment, language use varies: approximately 2/3 use spoken language, Finnish or Swedish whilst 1/3 use Finnish Sign Language as their primary means of communication (Kuurosokean kommunikointi 1991). Most persons who are deafbind live alone or with their families. However, whether a person with deafblindness lives alone or with his or her family, independent living outside of a community in which there are no other deafblind or deaf members can lead to social isolation and feelings of loneliness. To facilitate daily living inside and outside the home, persons with deafblindness usually require outside contacts and help (e.g., information acquisition, shopping, going to the bank or the post office (Kuurosokeiden elinolot Pohjolassa vuonna 2000)). Within the group of persons with acquired deafblindness, the largest single cause of deafblindness is Usher syndrome (Lahtinen and Miettinen 1991; Olesen and Jansbøl 2005; Pakarinen 1997). It is inherited and often latent, which means that it can appear suddenly after not being manifested for several generations. Usher syndrome includes persons with varying degrees of hearing impairment (from mild hearing loss to deafness), and the visual disability caused by retinitis pigmentosa. This causes narrowing of the visual field, which creates so-called tunnel vision, increases night blindness and weakens contrast sensitivity. The development of a visual or hearing impairment in Usher syndrome is unpredictable. The causes of congenital deafblindness include the mother's prenatal rubella (German measles) other diseases, and the consequences of various infections (Kaitalo 1990; Siksi-projekti 2005). Thus, persons with deafblindness differ in the severity and time of onset of hearing and vision impairments, concurrent limitations, and strengths. Deafblindness often has a particularly strong effect on a person's communication, environmental orientation, and information acquisition (Kaitalo 1990). Deafblindness can also make it difficult for persons to show their special abilities (Hassinen 2004; Möller 1999; Tully 1988; Hassinen 2010). For many deafblind persons the stress of coping with their daily lives and the challenges associated with their communication limitations can lead to physical stress, tension, fear, and anxiety. Most of the data on the psychological and social aspects of deafblindness derive from rehabilitation settings in the United States (Miner 1995, 2002). Recently, however, a large survey on the effects of deafblindness was done in Scandinavia (Olesen and Jansbøl 2005). This study indicated that people with hearing and vision problems are often underidentified and may lack proper diagnoses. Making diagnosis more difficult, some deafblind persons try to hide their problems. According to Miner (1995, 2002), the most common psychological problems with young persons who are deafblind are adverse reactions from peers at school, worrying and feelings of sadness associated with visual problems, and communication difficulties with family and friends. During adulthood typical psychological difficulties include anger, depression, fear for the future, lack of hope and pleasure, suicidal thoughts and attempts, anger against those who can see, fear of losing the love and respect of family members, and a feeling of extreme isolation, particularly when friends no longer initiate contact (see also Brennan 1997; Ehrenbåge and Samuelsson 1998). Some persons have also had traumatizing experiences in their lives. There is some data suggesting that deaf children are 2–3 times more likely to be sexually abused than their hearing peers (Kvam 2004). Data from the psychiatric clinic of the Hospital District of Helsinki and Uusimaa (Hus) in Finland indicate that the behaviour problems of persons who are deafblind do not differ significantly from persons who are deaf only. The most common problems among the deaf were depression, anxiety, personality disorders, substance abuse, schizophrenia, bipolar disorder and psychotic behaviour. Additional diagnoses generally include epilepsy, intellectual disability, developmental disability or dysphasia or other linguistic disorders (Ryynänen and Kostamo 1998). A study that evaluated the psychiatric symptoms of 213 deaf or deafblind persons using sign language was conducted in Finland between 2002 and 2004 (Lindfors 2005). The results indicated that the most common psychological symptoms reported by the respondents were loneliness (19%), depression (17%), and anxiety symptoms (16%). Altogether, psychiatric problems were present in 24% of the respondents. The number is slightly higher than in the average Finnish population (19%). Also the need for help in discussing problems was significantly higher among the respondents (14%) than among the population at large. Respondents were particularly interested in receiving help in dealing with relationships, work, and their psychological problems. These data are similar to those from a Nordic survey (Olesen and Jansbøl 2005), which found that over one-third of the 20 people interviewed reported having used the services of a psychologist in order to cope with the emotional or other difficult reactions related to a crisis. Although there is overlap in behavioural and emotional problems between persons who are and are not deafblind, it is likely that the causes of these problems are different for the two groups, strengthening the potential benefits of careful psychological assessment and case formulation. It is important to collect more information on the psychological problems that deafblind persons face in order to develop the best treatment strategies. It seems that persons with deafblindness have problems related to their sensory impairments and they experience unpleasant emotional reactions associated with these impairments such as anxiety, communication difficulties, and mood problems associated with adverse and challenging life experiences (Miner 1995, 2002; Olesen and Jansbøl 2005). Because of these multiple problems and individual differences among persons in the problems they face, and differences in causal variables for their problems (e.g., inherited impairments, depression, social isolation, abuse, challenges to learning, etc. ), there is a need for an individualized approach to clinical case formulation and treatment. One case formulation model is Functional Analytic Clinical Case Diagrams (FACCD), (see Haynes and O'Brien 1990; Haynes and O'Brien 2000; Haynes and Williams 2003; Petermann and Müller 2001; Haynes, O'Brien, and Kaholokula 2011). In FACCD, the case formulation (functional analysis) is illustrated with a causal diagram that presents aspects of an individual client that are relevant to explaining and treating the client's behaviour problems and helping the client attain his or her treatment goals. These aspects include the client's behaviour problems and goals, functional relations among behaviour problems, the relative importance of behaviour problems, the strength and form of causal and non-causal relations for behaviour problems, and the modifiability of causal variables. The essential part of FACCD is the functional relations among variables–the functional analyses. The functional analysis and FACCD are most clinically useful in three contexts: (1) with complex clinical cases–especially with clients with multiple problems areas and multiple, interacting causal variables, (2) with cases in which standardized treatment is failing, and (3) in treatment team settings in which treatment goals for a client are discussed. Thus, it could be argued that the deafblind persons and professionals working with deafblind persons may benefit from a functional analysis and the FACCD. The information depicted in the FACCD can be useful in several ways. It organizes the clinician's clinical judgments relating to a client's behaviour problems and their causes; it encourages a sequential, systematic, and specific clinical case formulation and decision making; it can point to areas where additional assessment is needed; it facilitates clinical case presentation to other professionals; it presents clinical hypotheses about the client; it encourages research on clinical judgment process; it encourages the use of science-based clinical assessment strategies; it focuses attention on current more than historical causal variables; it reduces the emphasis on formal psychiatric diagnosis, and it can be used to illustrate variables and relations that affect treatment goals. The functional analysis can be used to supplement or as an alternative to the American Psychiatric Association's DSM-system (APA 2000). The main difference between these approaches is that the functional analysis looks beyond the diagnoses and labelling of behaviour problems and emphasizes functional relations in order to make a client's problems and other behaviour problems understandable–the main goal of the functional analysis is to explain behaviour problems and suggest the best treatment focus. Although diagnosis can be useful in case formulation, there are several limitations when using diagnoses in clinical practice (see review of the role of diagnosis in behavioural assessment in Nelson-Gray and Paulson 2004). A diagnosis is often helpful when communicating information between professionals within the healthcare system. However, because a particular diagnosis can reflect many different combinations of symptoms, a diagnosis is often insufficient for understanding and effectively treating a client's behaviour problems. The descriptions of a disorder, such as deafblindness, give little information on specific behaviours of a particular client, the unique aspects of a client's situation, his or her goals and strengths, or the variables that may be affecting them. When developing an individualized psychological intervention such as cognitive behavioural approaches, more specific information on specific problems, causal variables, and their functional relations is necessary. A diagnosis provides no information about how problematic behaviours vary across situations and contexts, and how different psychological problems and external events may interact with each other. Further, a diagnosis may not address psychological problems that can have significant impact on the quality of life of a deafblind person. We were interested in understanding the psychological problems faced by many deafblind persons. The purpose of this article was to describe deafblind persons who have multiple psychological problems and apply the functional analysis and FACCD to better understand these problems. We give examples of how a functional analysis model and FACCD can aid the rehabilitation and treatment of persons who are deafblind. The cases were collected during behavioural assessment training provided for professionals working with persons who are deafblind. First, the professionals were trained to use the functional analysis and FACCD and instructed in how to apply the model for their own client cases. The data presented in this paper are based on the trainees’ cases. Behavioural assessment training was provided to 69 professionals (staff members, rehabilitation workers, nurses, psychologists, social workers, teachers, etc.) working with persons who were deafblind or deaf. The training was done during three two-day workshops and using home assignments. During the training, client case examples were analyzed using the functional analysis model of case formulation. The staff members were instructed to bring information of one client case–with multiple problems–to the workshop. They were also instructed to gather information about their client from different sources, e.g., documents on the client's history, and current life situation, possible interview with the client about the current problems, observation of the client's behaviour, and case conferences dealing with the client. The staff members did not use any validated instruments for assessing psychological symptoms because that was not part of their profession. The first workshop included lectures on general issues of functional analysis and neurocognitive issues related to deafblindness. Between workshops the trainees were instructed to begin applying functional analysis with their clients. Workshop two dealt with physical and psychological issues in well-being. The trainees were instructed to finish the behavioural analysis cases after workshop 2. Workshop 3 concentrated on short and long term interventions. The functional analysis model learned during the workshop was as follows: (1) background information about the client is collected; (2) the problems and strengths of the client are listed; (3) problems are classified according to different forms of behaviour (i.e., response modes such as physiological reactions, emotional reactions, thoughts and verbal communication, acting and doing); (4) the case formulation is illustrated with a causal diagram that presents behaviour problems and functional relations among behaviour problems, the relative importance of behaviour problems, the strength and form of causal and non-causal relations for behaviour problems, and the modifiability of causal variables; (5) conclusions are made on the basis of the analysis, and treatment plans are made on how to best help the client. The different symbols used in the FACCD are described later in this paper in the Appendix. Briefly, the rectangle indicates a behaviour problem; a circle indicates a causal variable (an antecedent variable, consequence, moderator variable), and a diamond indicates a historical causal variable that cannot be modified. These symbols illustrate a client's problem areas as well as contextual and situational variables, moderator variables, and contingencies that affect them. 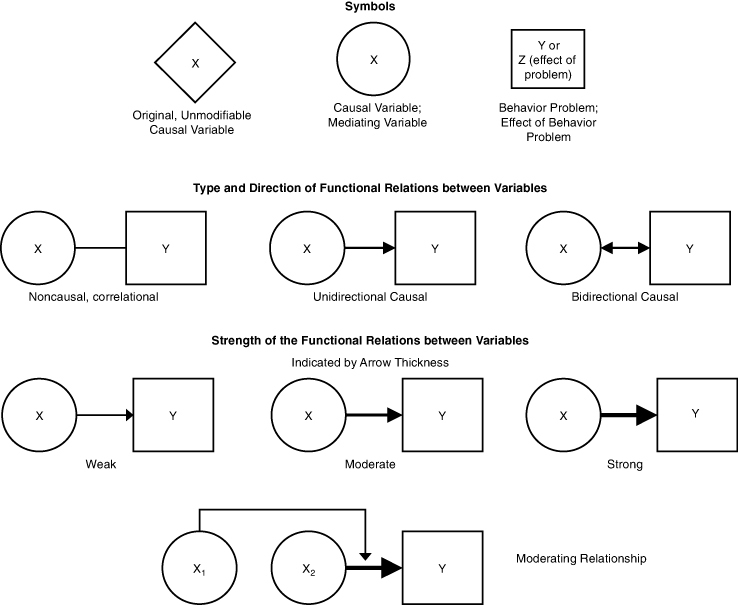 The functional relations between the variables are depicted by arrows and lines that indicate the strength, direction, and form of functional relation. (Haynes and O'Brien 2000; Haynes, O'Brien, and Kaholokula 2011). The overall goal of the functional analysis and the FACCD is to estimate the relative magnitude of effect of each causal variable. That is, the degree to which a treatment focus on the causal variable would be expected to result in benefits for the client. Although effects can be calculated mathematically, this estimate can often be done through visual inspection of the FACCD. Clinical judgments from the FACCD can be more precise by adding judgments of the importance of a problem by using numbers or, as in this model, graphic illustration. The strength of the connection between variables can be estimated by using different line thicknesses. (Haynes, O'Brien and Kaholokula 2011). There were altogether 38 deafblind or deaf clients analyzed using the model by the trainees who attended the training. Some of the case formulations were made by one staff member whilst others were constructed by pairs or small groups of participants. Of those 38 analyses, 26 complete analyses were chosen for this article. These cases selected included all the steps of the model as presented above (Haynes, O'Brien, and Kaholokula 2011 actually propose 21 steps in the functional analysis of clients). Twelve clients were omitted from this article as their case formulations were incomplete because of limited time during the workshops. The 26 complete cases were divided into three groups according to hearing and vision impairment and time of onset. The number of men and women in each group was as follows: Group 1. Deafblind clients with acquired deafblindness: 4 men, 10 women (14); Group 2. Congenitally deafblind clients: 4 men, 3 women (7); Group 3. Deaf clients with or without additional impairments, no vision problems: 4 men, 1 woman (5). Because the main interest was on groups of individuals with deafblindness, groups 1 and 2 (persons with acquired deafblindness and congenitally deafblind persons) were chosen for more thorough data analysis. The two groups of persons with acquired and congenital deafblindness were defined as follows. First, the group of clients with acquired deafblindness (n=14) consisted of those persons who had become or were becoming deafblind later in their lives. Within this group, persons could have (a) been born visually impaired and their hearing weakened later; (b) been born with hearing impairments and their vision weakened later, or (c) become deafblind as adults or as older adults. The group of congenitally deafblind clients (n=7) included persons who had been born with hearing and vision impairment. The mean age of the persons in the group with acquired deafblindness was 54.8 years (range 14 years to 86 years) and the group of congenitally deafblind persons was 29.3 (range 16 years to 50 years). There were more females (n=10) than males (n=4) in the first group, and the number of females (n=3) and males (n= 4) was nearly equal in the second group. In the acquired deafblindness group half of the subjects used speech and half Finnish Sign Language as a primary communication method. Of sign language users approximately half used signing in free space and half used tactile signing. In the congenitally deafblind group most of the subjects had multiple means of communication based on sign language, gestures, objects, and pictures. In the acquired deafblindness group 12 subjects were unmarried. In the congenitally deafblind group all subjects were single. In both of the groups most subjects lived in residential housing facilities or with family members (the acquired deafblindness group n=9 and the congenitally deafblind group n=7). Five subjects with acquired deafblindness lived alone. Consistent with the results of past research, and on the basis of assessments done by the staff members, the most common difficulties within the both groups were problems with communication. Both groups reported an average of about seven psychological problems per person (ranging from 3 to 11). The main problems of the subjects with acquired deafblindness were communication difficulties, traumatic or distressing experiences (e.g., mocking at school, accidents in traffic due to limited hearing and vision, sexual harassment), mistrust and suspiciousness (e.g., somebody has been in a person's home and stolen money), sleeping problems (e.g., difficulties falling to sleep), loneliness, and social isolation. These problems were reported by more than 50% of the deafblind persons. In addition to the main problems, the subjects with acquired deafblindness reported having problems such as negative thinking, fear of losing control in life, problems with nutrition (e.g., eating too few meals), socially unacceptable behaviour (e.g., ringing the doorbell of neighbours during the night), frequent changing of medication, eating problems (e.g., binge-eating), passiveness, shyness, and alcohol abuse. Within the group of congenitally deafblind persons, the most common problems were communication problems, aggressive or self-injurious behaviours (e.g., hitting her/himself by banging her/his head on the wall, hitting and biting other persons), impatience, and restlessness ( e.g., leaves table before finishing eating, does not wait for staff to help with putting clothes on). Also over 70% of these subjects had rapid mood changes, medical problems (e.g., epilepsy, congenital heart failures), and anxiety and fear problems (e.g., towards new staff members and new situations). Additional problems reported were as follows: life was too structured and restricted (because frequent changes in everyday life cause, for example, anxiety), problems associated with puberty and sexuality, problems associated with nutrition and health, constant changes in medication or neurological problems. Since the literature (e.g., Kvam 2004) has suggested that the incidence of traumatic life experiences could be high among deafblind persons, we did additional analysis of these problems in our sample. Among those subjects with acquired deafblindness, 9 subjects out of 14 (64%) reported the traumatic life experiences mentioned above. Many of those having traumatic experiences reported sleeping difficulties, aggressive behaviour, and severe mental health problems (including psychotic behaviour, delusions, and personality disorders). Only one person with congenital deafblindness was reported as having had a traumatic life experience (14%). More specific analysis of trauma experiences would be needed in order make appropriate treatment plans but because of the design of the study we were not able to collect these data. An important finding, with implications for individualized case formulations and treatment, is that there were important differences among person in the types of problems experienced. In order to illustrate both the complexity of the individual cases and the benefits of the functional analysis model two case examples are presented. These case examples were done during the workshops. The background information has been modified in order to protect the identity of the subjects. The client was a deaf man of about 50 years with Usher Syndrome. He was born deaf and had gradually been losing sight so that he had only a narrow visual field left. His native tongue was Finnish Sign Language although Finnish had been the language of his childhood family. This and oral method at school had effected his mastering of sign language. The client used an old-fashioned type of sign language which caused some communication problems. Young staff members and interpreters in particular had difficulties understanding his signing. He used little Finnish, for example, and he fingerspelled words. He had stopped work because of his vision deterioration and was on a pension. He lived at a residential centre which provided housing facilities and communication through sign language. He received help for his house chores and other domestic chores when needed. His main problems were difficulties in communication because of language deficits, lack of skill in managing his money and a severe drinking problem. Approximately twice a month, he had a heavy drinking period which would last for 4–5 days and which sometimes caused vision and sensory delusions with consequent anxiety. He also had difficulties with social relationships because of violent behaviour and bothering people with asking for money during drinking periods. This led to fear and avoidance among some of the other residents as well as frequent conflicts between him and other residents. Figure 1 shows the case formulation (FACCD) made by the staff members. It indicated the strong association between language deficits and drinking problems. Drinking, on the other hand, influenced several other problems like violent behaviour. Conversely, his deficits in communication and fear of losing his sight affected his drinking, so drinking would be used to reduce this anxiety and feelings of distress. The case formulation suggested that there was a behavioural chain leading to violent behaviours and problems in relationships. As illustrated in Figure 1, deafblindness due to Usher Syndrome leads to a fear of losing vision (this fear probably includes specific thoughts and emotional reactions that we were not able to describe in this study). The fear of losing vision causes anxiety, and anxiety increases the probability of excessive drinking of alcohol. Excessive drinking increases the probability for violent behaviour (e.g., pushing people). Violence is associated with problems in relationships. Additionally, relationship problems are affected by problems or limitation of using sign language. The functional analysis illustrated by the FACCD suggests several treatment possibilities. The treatment could address fear of losing vision and the associated anxiety. It might be possible to help him reduce his anxiety by discussing his fear and the possible consequences of the loss. In order to deal with these problems more information of specific thoughts and emotional reactions associated with the fear would be helpful. Thus, one of the benefits of a functional analysis and FACCD is that they can help the clinician understand where additional assessment data would be helpful. For example, when using exposure procedures (Rothbaum, Foa, and Hembree 2007), it would be helpful for the therapist to know what contextual variables (e.g., situations) trigger specific emotional reactions, and what thoughts are associated with these reactions. Further, acceptance strategies (Eifert and Forsyth 2005) could be used for dealing with the anxiety. Thus, we could teach the client to be willing to have his own experiences related to deafblindness, fear of losing vision, and anxiety (Hayes and Smith 2005). Acceptance means opening up and making room for painful feelings, sensations, and emotions (Harris 2009). Specific knowledge of these emotions and knowledge of avoidance behaviours associated with them would be helpful in treatment. Another alternative would be to consider the role of staff members’ responses to the client. Are they appropriate to his behaviours? Is it possible that the arrangement at the institution might contribute to the problems (e.g., activities, staff training). Thus, the FACCD points out both for the client and for the staff possible critical behaviours to be analyzed more closely. According to the FACCD made by the staff members, there could be additional targets for the treatment. The staff members could also address alcohol abuse, violent behaviours, and communication problems (problems in using sign language). Violent behaviours are probably a function of communication problems, social skills deficits, alcohol use, etc. Several options exist for dealing with these difficulties. For example, staff members could increase self-knowledge of the client by describing more closely in co-operation with the client each of these problems (e.g., what usually happens in these situations, and what the triggers are for his behaviour). Also it might be helpful to teach him better communication strategies so that the client could learn better ways to communicate with others, to communicate his wishes, to have more social contact and express himself, and increase enjoyable activities. Training the client's social skills would help reduce violent behaviours (Bourne 2005). He also needs other ways to reduce anxiety other than drinking, such as meditation, relaxation, physical activity. Furthermore, motivation for making changes with these problematic behaviours could be increased by value analyses (Dahl et al. 2009). Description of values could be used to help the client select direction for his life that is congruent with what is deeply important to him. This may help to establish goals supporting movement in a direction that increases the quality of life of the client. Thus, by helping the client define what matters to him, it may provide a context in which he may be more willing to experience difficult thoughts and feelings and anxiety associated with excessive drinking, violent acts, and communication difficulties. This may increase the possibility that the client is more willing to make changes with the problems pointed out by the visual diagram. These examples illustrate how the case formulation with persons who are deafblind can help staff members or a therapist understand factors that are helpful in making treatment decisions. The client was a 20 year-old woman born deaf and with slight visual impairment. She had also been diagnosed as having a learning disability and mild mental retardation. She communicated using signs, gestures, pictures, and objects. She lived in a residential housing facility that offered sign language services. She worked every day at the sheltered work facilities with a personal assistant. In her every day practical activities she was relatively independent. According to the members of staff, her main problems were anxiety and mood changes. Anxiety affected many aspects of her daily living. It was suggested by the staff that her anxiety was connected in some way to sexuality (such as physiological reactions in her body). This hypotheses made by the staff is problematic. “Sexuality” would probably not account for a variation in feelings of anxiety. “Sexuality” is a trait and anxiety level usually varies across hours and days. Thus, here the FACCD points out that more specific analysis is needed in order to understand this relationship. However, because the client was using only a limited amount of signs and communicated mainly via pictures, gestures and objects, the staff was not able to specify thoughts and feelings connected to these physiological reactions. It seemed that anxiety had increased during puberty. The staff had been hypothesizing that one possible cause for anxiety could be some neurological impairment. (It is important to notice that these kinds of hypotheses are not useful causal analysis. They would lead the staff to conclude that there was nothing they could do to help her because it was neurological.) They described that she had periods when her actions stopped without any clear reason. During this kind of “attack” she seemed to have an epileptic type of seizure and she seemed to “be absent”, but there was no formal diagnosis of epilepsy. Before or during the attack she seemed to hold her breath, her face turned red and her body was tense. The staff pointed out that “the attacks” could also produce or increase anxiety. However, they did not have enough information about the situations like, for example, where and when the attacks were most likely to occur. Most behaviour problems are not random. Identifying situations in which these problems occur can help identify factors that trigger or maintain them. The staff also reported sleeping difficulties and problems in social situations, like refusing to be in contact with some staff members. She seemed to be emotionally unstable (e.g., she reacted instantly to changes in her environment) and it was thought that this was related to her difficulties in handling anxious moods. It was also hypothesized that anxiety increased when she was experiencing difficulties communicating, but there was no clear evidence that the anxiety level was different between situations where she was using sign communication or not. Still, difficulties could arise because of, for example, different reactions to men versus women, older versus younger people or staff versus other patients. The functional analysis can indicate where additional information is needed. Figure 2 shows the case formulation made by the members of staff. The formulation points out several rather complicated interactions between different problems and possible causal variables. This case description is an example of the advantages of a visual functional case formulation. It is easier to summarize complicated information if it is presented diagrammatically. The case formulation illustrated in Figure 2 suggests that there were several variables affecting anxiety. There were sleeping difficulties, possible neurological problems or impairments (shown as a diamond shape), constant changes in medication, experiencing her life to be too structured or her environment too limited, and experiencing demands that were too low in relation to her functional capacity (note that it was not clear how this would be mediated). The anxiety produced was associated with compulsive behaviours (e.g., constantly moving her legs while sitting), self-harming behaviours (e.g., banging her head against a wall), sleeping problems, and withdrawal in social settings, especially when she had to meet new people. The analysis pointed out that self-harming and other compulsive behaviours were possibly used to reduce anxiety. Compulsive behaviours were associated with low self-esteem that was at least partly caused by demands being too low and a lack of actions related to limited demands. Difficulties experienced in social situations kept her living at home and limited her learning new social skills. The Functional Analytic Clinical Case Diagram suggests that by reducing her levels of anxiety or the number of anxiety episodes she experienced could lead to a reduction in several other problems. In other words, the functional analysis pointed out the possibility that by targeting the treatment to deal with one central problem, several other problems could be altered. The analysis indicated that the client made attempts to control or alter anxiety by harming herself and through compulsive behaviours. On the basis of this, it could be hypothesized that she probably also used other behaviours to regulate or control anxiety. Thus, the case formulation indicated that there might be other problematic behaviours not yet named by the staff member (or by the client). One of the main targets for the treatment could be teaching the client to deal with her anxiety in ways that do not have negative consequences for her quality of life. 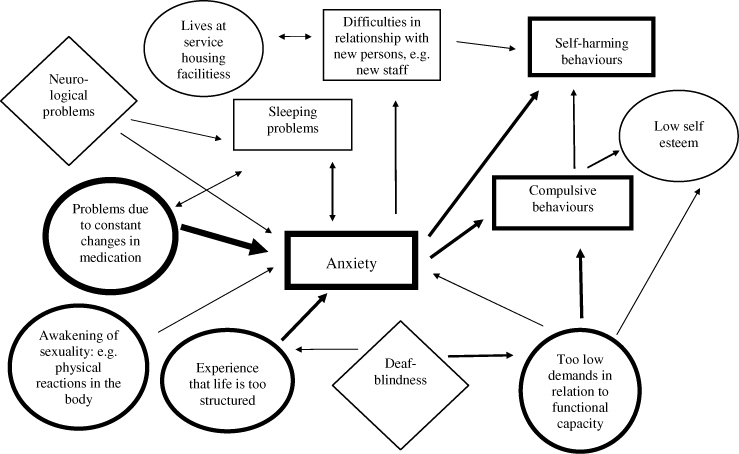 The diagram points out several variables that affect anxiety and which could be used in the treatment. For example, teaching the client to reduce her anxiety levels and teaching her new ways to cope when she feels anxious so that other behaviour problems don't occur may require that the clinician produce (in a controlled manner) anxiety during the sessions. Thus, the functional relationships presented in the case formulation may help the staff members anticipate the reactions and behaviours of a client. This might be especially useful with clients who have limited communication skills. Furthermore, on the bases of the case formulation, the staff members or the therapist would know that the client may need new skills to deal with her anxiety (for example, relaxation or acceptance skills). These few examples show how the FACCD could be applied in rehabilitation or in treatment. Several other possibilities exist for applying the diagram in the treatment of case number 2. One of the advantages of the case formulation model is that it usually points out several treatment alternatives. According to the members of staff who took part in the training of functional analysis and the FACCD the use of the case formulation model was helpful but also challenging. Participants reported that the FACCD helps staff to present the information about a client in a compact form, and it helps them to more clearly understand clients’ current problems and factors affecting them. It was, however, pointed out that it was challenging to estimate the types of functional relations and their strength between different variables. According to the participants, the diagram also helped them to observe their own impact on their client's problems. It was also mentioned that the case formulation helps the clients to understand their own situation and to more specifically describe the goals and rationale for the rehabilitation efforts. One of the disadvantages stated was that the FACCD takes a lot of time to establish and cannot therefore be done with all clients. The purpose of this article was to illustrate the application of functional analysis and Functional Analytic Clinical Case Diagrams (FACCD) (Haynes, O'Brien, and Kaholokula 2011) to describe possible psychological problems among deafblind persons having multiple problems, and to give examples of how a functional analysis approach to case formulation and FACCDs could assist in the rehabilitation and treatment of persons who are deafblind. The assessments and functional analyses made by the staff members indicated that some deafblind persons may have a relatively large number of psychological problems significantly affecting their quality of life and that the array of problems and their causal relations differed among deafblind persons. The group of deafblind persons analyzed in this study reported 3–11 psychological problems in addition to hearing and vision difficulties. These problems, along with their communication problems, may require more precise and individualized analyses and treatment. The interaction between different problems can be complex. As to be expected, communication (both receptive and expressive communication) problems were very common among persons who had been born with hearing and vision impairment and among persons who had acquired deafblindness as adults. Earlier studies by Miner (1995, 2002) and Olesen and Jansbøl (2005) support this observation. They noticed that the most common psychological problems with young deafblind people seem to be experiences of mocking at school, worrying and feelings of sorrow associated with visual problems, and communication difficulties with family and friends. The observation that almost all subjects in this study reported communication difficulties is not surprising. However, the fact that communication difficulties were stated as a problem by so many subjects points out that communication difficulties, and especially their effects on psychological wellbeing, should not be underestimated. This is also challenging to the assessment and treatment process as well as a difficult challenge for counsellors. The fact that communication problems were reported so often raises the possibility that there are communication difficulties between the staff members and deafblind clients and that intervention at the level of the institution may be warranted. This points out the importance of communication training as well as the possible need for supervision. It is also important to keep in mind that communication difficulties can also lead to other psychological problems of the clients. Thus, there is probably an interaction between the client's psychological problems and communication difficulties. The FACCD or other case formulation models can be used to describe and highlight individual interactions between communication difficulties and other psychological problems. In addition to communication difficulties several other psychological problems were reported by the deafblind persons included in this study. Most of the subjects who had acquired deafblindness as adults reported traumatic experiences, mistrust and suspiciousness, sleeping problems, and loneliness and isolation. In addition to these commonly reported problems several other psychological difficulties were observed such as negative thinking, fear of losing control in life, problems with nutrition, socially unacceptable behaviours, eating problems, passiveness, shyness, and alcohol abuse. These observations are in accordance to earlier studies (Brennan 1997; Ehrenbåge and Samuelsson 1998; Miner 1995, 2002) reporting that typical psychological difficulties among deafblind persons have included, for example, anger, depression, fear for the future, lack of hope and pleasure, suicidal thoughts and attempts, fear for losing the love and respect of family members, and a feeling of isolation. Within the group who had born with deafblindness, the most common problems in addition to communication difficulties were aggressive behaviours, impatience, and restlessness. Furthermore, the majority of these subjects reported rapid mood changes, medical problems, and anxiety and fear problems. It is important to note that the problems described above were collected from a selective group of clients who were chosen because the staff members expected them to have multiple problems. Thus, the data presented in the study do not suggest that all persons with visual and hearing impairments have psychological problems. This paper only points out the fact that clinicians should be aware that deafblind persons may have other difficulties and indicates the types of problems a deafblind person may experience. It is also important to remember that psychological problems vary from individual to individual. This can be seen in the cases presented in this paper. The fact that deafblind persons may have several psychological problems in addition to communication difficulties, and the fact that the combination and the consequences of the problems are always very individual gives many challenges to the staff members. The case formulation model and FACCD presented here can be a useful tool which staff members could use in order to understand persons with visual and hearing difficulties especially when there are indications of multiple psychological problems or a client has not been responsive to treatment. The case formulation model can be used and applied by professionals other than psychologists or psychiatrists. One of the great advantages of the FACCD model is that it may give very useful hypotheses of complex interactions between different problems and variables that may not otherwise be noticed. The model makes it easier to see the complexity and diversity of a client's situation. Without the model it would be difficult to see the interaction between variables that are crucial for change. Therefore the FACCD model can be a useful tool in case conferences. Although it is time-consuming in the beginning, it can ultimately be time-efficient. Further, it is possible that a broader formulation may result when a group of clinicians interact with the client in different ways and in different contexts, and collect different data (see, for example, Horowitz et al. 1989). The visual case model formulation can also help clients describe and understand their present life situation. If the client is not able to see, the staff members can go through the case diagram verbally. It is possible that case formulation increases clients’ self-knowledge. It may even change the concept of self. When case formulation is done in close co-operation with the client, it may give distance to her/his situation. That is to say, the client is viewing her/his situation from another perspective. In fact, it has been suggested that this phenomena, called also “the observing self”, is one of the key processes in psychotherapy (Hayes, Strosahl, and Wilson 1999). Furthermore, case formulation may function as a motivational tool in counselling and in the treatment. Since the model is usually done in close co-operation with the client, the client is automatically involved in the counselling or in the treatment process from the beginning of the treatment. To make a relevant case formulation, good assessment is crucially important. However, staff members are not usually trained to use formalized behavioural observations, staff-rating forms, and structured interviews. Training staff members to use these assessment tools may increase the accuracy of the case formulations models. The model helps also to specify treatment goals, and possibly the order in which the interventions methods will be used. The case formation model can also be used as a tool for assessing intervention effects. The intervention may include functional analysis, psycho-education, communication and social skills training, exposure procedures, behavioural activation, body awareness training, value work (including individual motivation assessment), acceptance, and mindfulness exercises (see, for example, Glickman 2009; Hayes, Strosahl, and Wilson 1999). The staff members can go back to the case formulation model during the treatment process in order to evaluate whether there are changes in the model done at the beginning of the treatment. Re-evaluation of the model is crucial, because the model is based mostly on a hypothesis made on the basis of limited information, and some of the hypotheses might be wrong. In fact, case formulation and intervention are closely connected. Intervention is needed in order to verify the hypotheses. The validity of the clinical inferences that are made on the bases of the FACCD depends on the validity of the assessment data upon which it is based. It must be remembered that the case formulation model describes hypotheses on the basis of available data. Since in clinical practice the data are often limited or missing, any hypothesis made during the assessment process may be too limited or even wrong. Ideally data should be acquired through multiple methods and sources. The validity of the FACCD is tested via the effects of the treatment based on it. It is important to monitor the effects of the treatment and frequently evaluate and refine the pretreatment model. The model made at the beginning of the treatment may be misleading. Thus, it is important to evaluate and to follow whether the treatment has those effects as expected. If expected changes in the behaviour problems do not occur, some elements of the case formulation are invalid and require modification. Important causal variables may have been missed, there may be moderator variables operating that were not identified, or the importance of, or relations among, behaviour problems, or the strength of relations may have been misestimated. The clinician should remember, and communicate to others, that functional analysis and the Functional Analytic Clinical Case Diagram are only a summary of the clinician's clinical judgments–or clinicians if there is more than one FACCD–at the time the assessment was conducted and in that assessment context. The elements of a Functional Analytic Clinical Case Diagram are likely to change over time, differ across contexts, and reflect measurement errors and clinical judgment errors. 1. For more information, please see www.kuurosokeat.fi. This study was part of a project called “Psycho-social support for Deafblind People”. The project was supported by the Finnish Slot Machine Association and conducted by the Honkalampi Foundation, the Service Foundation for the Deaf, and the Finnish Association of the Deafblind. American Psychiatric Association. 2000. Diagnostic and statistical manual of mental disorders., 4th ed. (DSM-IV, text rev.). Washington, DC: Author. Bourne, E.J.2005. The Anxiety and Phobia Workbook. Oakland, CA: Harbinger. Brennan, M.1997. Point of View. Mental Health issues of Deaf-Blind Adults. JADARA - A Journal for Professionals Networking for Excellence in Service Delivery with Individuals who are Deaf or Hard of Hearing20, nos. 2 and 3: 28–35. Dahl, J.C., J.C.Plumb, I.Stewart, and T.Lundgren. 2009. The Art of Valuing in Psychotherapy. Helping Clients Discover, Explore, and Commit to Valued action Using Acceptance and Commitment Therapy. Oakland, CA: New Harbinger Publications. Ehrenbåge, Y., and M.Samuelsson. 1998. Att vara dövblind med Usher Syndrom Typ I – Intervju med 5 vuxna dövblinda I Örebro län, Götebors universitet: Institutionen för socialt arbete. Eifert, G.H., and J.P.Forsyth. 2005. Acceptance and Commitment Therapy for Anxiety Disorders. A Practitioner's Treatment Guide to Using Mindfulness, Acceptance and Values-Based Behavior Change Strategies. Oakland CA: New Harbinger Publications. Glickman, N.2009. Cognitive-Behavioral Therapy for Deaf and Hearing Persons With Language and Learning Challenges. New York: Routledge. Harris, R.2009. Act made simple. An Easy-to-Read Primer on Acceptance and Commitment Therapy. Oakland CA: New Harbinger Publications. Hassinen, L.2004. Kuurosokeiden asiakkaiden psykologiset ongelmat: Kokemuksia psykososiaalisesta ja psykoterapeuttisesta tuesta. Kuurojen Palvelusäätiö: Kuurosokeiden psykososiaalisen tuen kehittämisprojekti. Hassinen, L.2010. Sense of Life. The Life World, Psychological Problems, Psychosocial and Psychotherapeutic Rehabilitation of Deafblind Clients. The Service Foundation for the Deaf: The MIELI Project. Hayes, S.C., and S.Smith. 2005. Get out of your mind and into your life: The new Acceptance and Commitment Therapy. Oakland, CA: New Harbinger Publications. Hayes, S.C., K.Strosahl, and K.Wilson. 1999. Acceptance and Commitment Therapy: An Experiential Approach to Behavior Change. New York: Guilford Press. Haynes, S.N., and W.H.O'Brien. 1990. The functional analysis in behavioral therapy. Clinical Psychology Review29: 171–91. Haynes, S.N., and W.H.O'Brien. 2000. Principles and Practice of Behavioral Assessment. New York: Kluwer Academic/Plenum Publisher. Haynes, S.N., W.H.O'Brien, and J.Kaholokula. 2011. Behavioral Assessment And Case Formulation. Hobroken, NJ, USA: Wiley. Haynes, S.N., and A.W.Williams. 2003. Clinical case formulation and the design of treatment programs: Matching treatment mechanisms and causal relations for behavior problems in a functional analysis. European Journal of Psychological Assessment19: 167–74. Horowitz, L.M., S.E.Rosenberg, G.Ureno, Kalehzan, B.M., & P.O'Halloran. 1989. Psychodynamic formulation, consensual response method and interpersonal problems. Journal of Consulting and Clinical Psychology57: 599–606. Kaitalo, H.1990. Kuurosokeat suomessa. Osa 1 Vamman määrittely ja tunnistaminen. Kuopion yliopisto: Yhteiskuntatieteet: Alkuperäistutkimukset 2/1990. Kuru: ArZet Oy. Kuurosokean kommunikointi. 1991. Brochure. Vammalan kirjapaino Oy. Kuurosokeiden elinolot Pohjolassa vuonna. 2000. A Finnish publication: Suomen Kuurosokeat ry. Original publication: Nordiska nämnden för handicappfrågor. 1993. Dövblindas Livsvillkor i Norden inför år 2000. NNH 8/93. Kvam, M.H.2004. Sexual abuse of deaf children: A retrospective analysis of the prevalence and characteristics of childhood sexual abuse among deaf adults in Norway. Child Abuse and Neglect28: 241–51. Lahtinen, R., and S.Miettinen. 1991. Usherin syndroma. Yhdistetyn kuulonäkövamman huomioiminen peruskouluikäisillä. Helsinki: Suomen Kuurosokeatry. Lindfors, O., ed. 2005. Psyykkinen oireilu ja psykoterapian tarve viittomakielisellä aikuisväestöllä. Kuurojen Liitto ry:n julkaisu35. Miner, I.1995. Psychosocial implications of Usher syndrome, Type I, throughout the life cycle. Journal of Visual Impairment and Blindness89, no. 3: 287–96. Miner, I.2002. Psychotherapy for People with Usher Syndrome. In Psychotherapy with Deaf Clients from Diverse Groups, ed. I.Leigh, 307–27. Washington: Gallaudet University Press. Möller, K.1999. Onödigt svårt. Intervjuer med 32 dövblinda i Örebro Län. Projekt-redovisning. Örebro läns landsting: Landstingstryckeriet. Nelson-Gray, R.O., and J.F.Paulson. 2004. Behavioral Assessment and the DSM System. In Comprehension Handbook of Psychological Assessment: Behavioural Assessment, ed. M.Hersen. New Jersey: John Wiley and Sons. NUD. 1986. European Conference on Staff Training to Deaf-Blind Services, Dronninglund. Olesen, B.R., and K.Jansbøl. 2005. Experiences from people with deafblindness–a Nordic project. Herlev: Videncenter for Døvblindblevne. Pakarinen, L.1997. USHER SYNDROME TYPE III (usH3). Acta universitatis Tamperensis 574. University of Tampere. Petermann, F., and J.Muller. 2001. Clinical Psychology and Single-Case Evidence. A Practical Approach to treatment, Planning and Evaluation. England: John Wiley and Sons, Ltd.
Rothbaum, B., E.Foa, and E.Hembree. 2007. Reclaiming Your Life from a Traumatic Experience. Workbook. Oxford University Press. Ryynänen, A., and S.Kostamo. 1998. Kuurojen psykiatrisen sairaalahoidon kehittäminen. Projektikokemuksia HyKs:n psykiatrian klinikalta. Kuurojen Palvelusäätiö. Siksi-projekti. 2005. Syntymästään kuurosokeiden nuorten elämänlaadun nostaminen. Suomen Kuurosokeat ry (The Finnish Assosiation of the Deafblind). Suomen Kuurosokeat ry (The Finnish Assosiation of the Deafblind). 1996. Aluesihteereiden tekemä kartoitus. Moniste. Tully, N.1988. Mental Health and Individuals with Usher's Syndrome. Annual Conference of the American Association of the Deaf-Blind, June12–19 in Baton Rouge, Louisiana, USA.